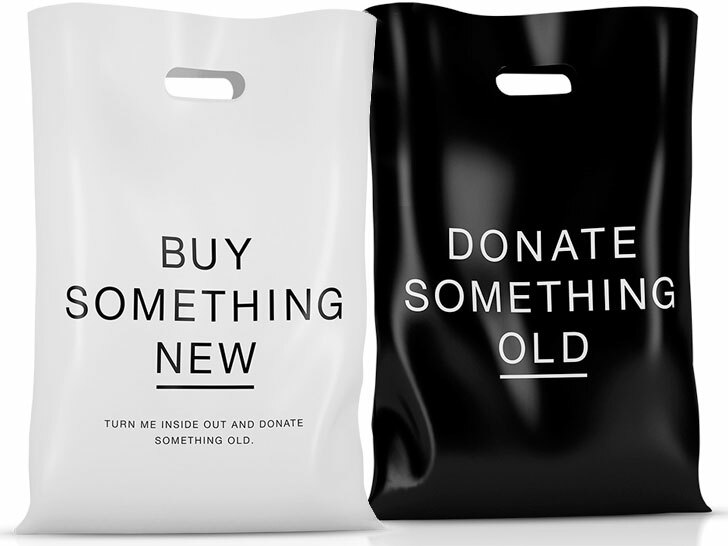 Donate something old every time you buy something new—that’s the philosophy behind the “Rag Bag,” a dual-function shopping carrier designed to make it easy for consumers to recycle unwanted clothes. The brainchild of Swedish fashion label Uniforms for the Dedicated, the bag flips inside out to become a pre-addressed, postage-paid envelope, ready for filling and depositing in the nearest mailbox. The product is a simple way of solving a complex problem, according to DDB Sweden, the advertising firm responsible for the carryall’s design. Made from thin, but sturdy, biodegradable plastic, the Rag Bag eschews frippery in favor of a clean, color-based aesthetic: white outside for “new” and black inside for “old.” The result turns a passive symbol of consumerism into an active tool for social and environmental change. Donate something old every time you buy something new�that's the philosophy behind the "Rag Bag," a dual-function shopping carrier designed to make it easy for consumers to recycle unwanted clothes. The brainchild of Swedish fashion label Uniforms for the Dedicated, the bag flips inside out to become a pre-addressed, postage-paid envelope, ready for filling and depositing in the nearest mailbox. The product is a simple way of solving a complex problem, according to DDB Sweden, the advertising firm responsible for the carryall's design.